I've been looking at old designs and now that over a year has gone by I wanted to recreate a few of my old designs since I'm a lot better. Here's a gradient for the base with a splatter design I did using a coffee straw from the gas station. The things you can use for nail art are endless. I'm posting both the matte and shiny looks because I couldn't decide which is best, which is your favorite? I did the gradient with a makeup sponge. Don't forget to use my code "MODNAILS" to get 15% off at checkout from HB Beauty Bar! wow I love what you did there! It looks awesome :D I'm keeping the idea in mind! Great job with the splatter! lol, was there much cleanup? I love black/charcoal/gray with pink and white. I would gladly have either of those on my nails, but I do favor the matte. Thank you so much! I know I love matte looks. And clean up was fairly easy but only because I put tape around my nails, I definitely suggest doing that because if I hadn't put the tape clean up would've been such a pain haha. Follow me..i will follow back. 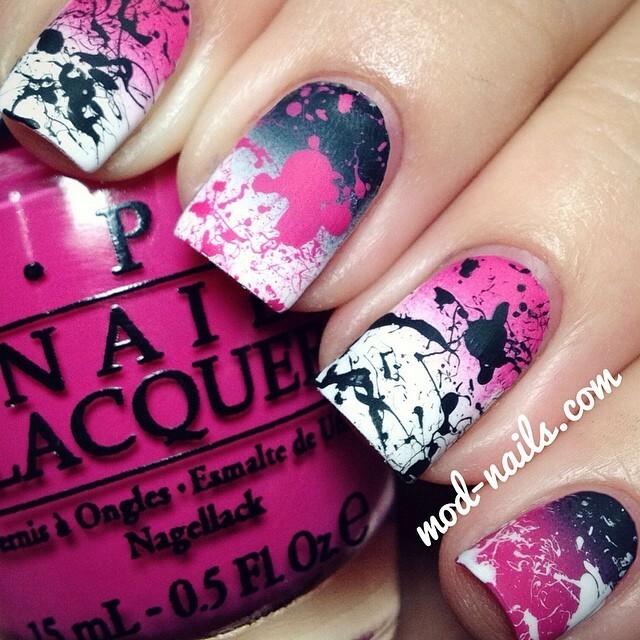 I want to do this, but was wondering do you put a base coat of white before you do the gradient? Just saw this on pinterest! This is stunning! Great job and use of colors!